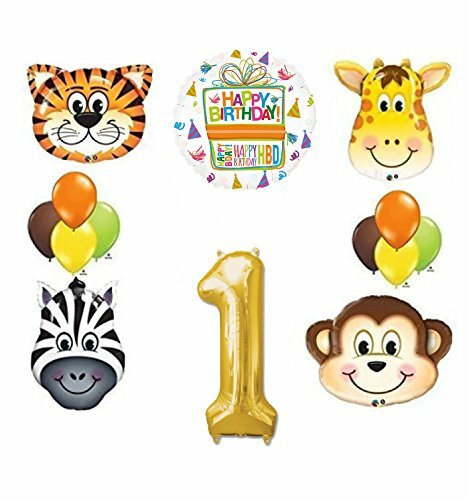 With this kit you will receive: (1) 32" Giraffe Head shaped Mylar Balloon, (1) 35" Monkey Head Shaped Mylar Balloon, (1) 32" Zebra Head Shaped Mylar Balloon, (1) 30" Tiger Head Mylar Balloon, (1) 34" Giant Gold Number 1 Foil Balloon, (1) 18" Birthday Present Balloon, (8) 11" Qualatex Latex Balloons 2- Orange, 2- Lime Green, 2- Yellow and 2- Brown. Just Add Helium and ENJOY! If you have any questions about this product by Mayflower Products, contact us by completing and submitting the form below. If you are looking for a specif part number, please include it with your message.